The Yakovlev-141 was meant to replace the Yakovlev-38 Forger, a subsonic aircraft of slightly less performance than its equivalent Western counterpart, the Harrier. These Soviet aircraft were designed for the air defense of the fleet, to be based on Kiev-class heavy aviation cruisers. 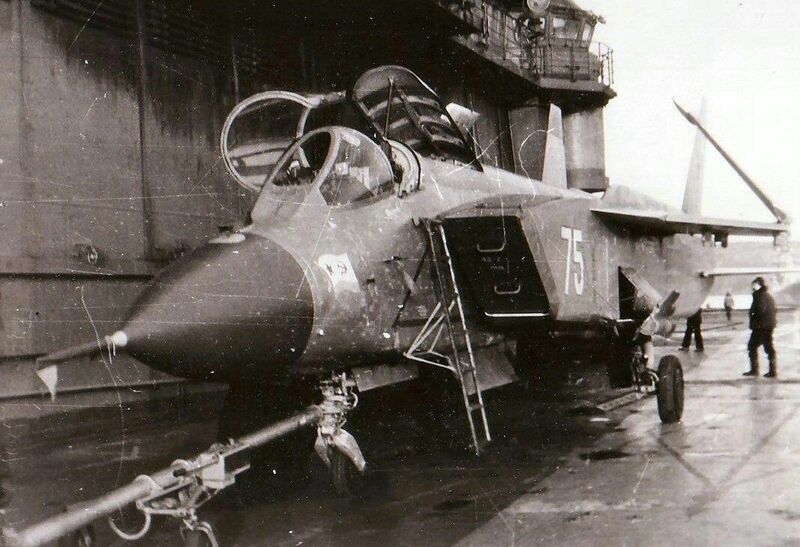 The Kiev ships were designed as smaller fixed-wing aircraft carriers, as the project of building supercarriers such as those of the United States was considered less cost effective by the Soviet Navy. One crucial improvement to the Forger’s design was the Yak-41’s ability to sustain continued supersonic flight. This, and other improvements, aimed at closing the gap between traditional jet fighters and Soviet VTOL-capable birds. Its engine layout was particular: three engines controlled its flight; two were dedicated to vertical takeoff and landing and were placed directly behind the cockpit, aiming directly towards the ground; the third, whose nozzle could pivot downwards, was in a classic layout and hung at the rear between the twin tail fins. Digitally controlled, these three engines, together with three swiveling yaw jets – one at the nose and one beneath each wingtip – kept the plane upright during vertical maneuvers. A total of four prototypes were built, two of which were flyable. The first conventional flight, made by chief test pilot Sinitsyn at Zhukovskii, took place on 9 March 1987. The first hovering flight was performed on 29 December 1989, and the first complete transition from vertical to high-speed flight and back to a vertical landing was mode on 13 June 1990. In the year of 1991, date of the dissolution of the Soviet Union, development of the Yakovlev-141 ceased due to lack of funding. However, Lockheed Corporation, then in the process of developing the X-35 for the US Joint Strike Fighter program, did accept to fund Yakovlev $385 to $400 million for three new prototypes and an additional static test aircraft to test improvements in design and avionics. Part of the problems of developing a jet-powered hovering aircraft is heat buildup. Although 26% shielded by heat-resistant titanium, graphite, and composites, the aircraft could not safely hover for more than 2½ minutes due to heat limitations. 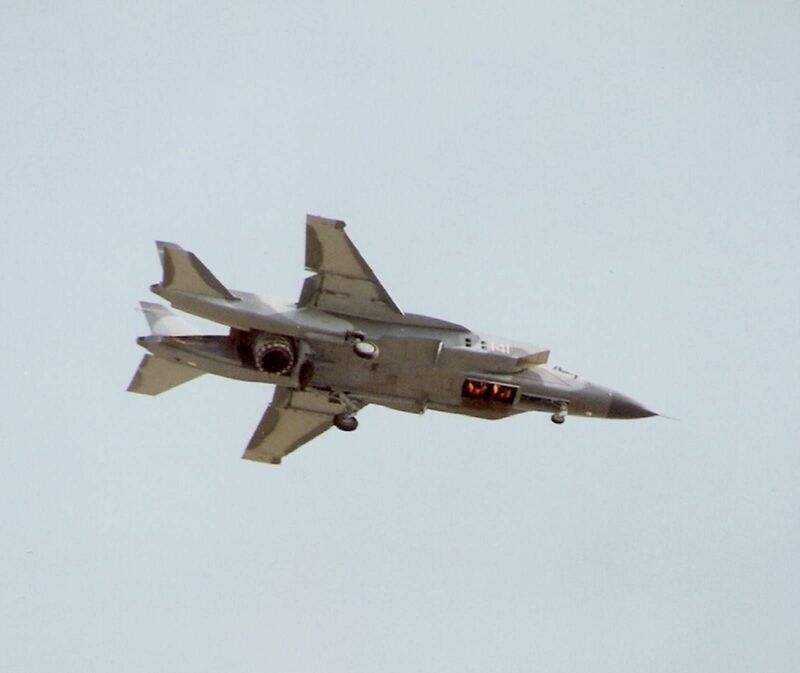 Yak-141 VTOL aircraft during hover at 1992 Farnborough Airshow, displayed through a partnership with Lockheed Martin. Unless otherwise mentioned, this webpage and its content is licensed under the Attribution 4.0 International license. You may quote and copy this material if you give correct credit to the author and do not distort or otherwise change the original meaning of his words. Copying any material on this website without giving correct credit to the author is both plagiarism and copyright infringment, and will be treated as such. Denis G. Labrecque published this document on December 27, 2016. Proudly hosted on GitHub using Jekyll markdown.